Buddhist Reiki is a Buddhist equivalent of angel and archangel energy works in the West, such as AngelLink. It offers you the opportunities to connect with various Buddhist Deities worshiped in Japanese and East Asian traditions. Buddhist philosophy says that Buddha has three levels of existence. The first is the ultimate Source itself beyond any manifested forms. It is All That Is, omniscient and omnipresent, the ultimate One. The second one is manifestations as many deities in subtle realms, such as Kuan-yin (Japanese Kannon) or Maitraya. They are high-dimensional beings who are devoted to helping humanity to evolve spiritually. The third one is the Buddha that manifested itself as human being with a physical body. The historical Buddha in the 5th century BC (the founder of Buddhism, Gautama Siddharta) was one example, but if we attain ultimate awakening we all will become the third-kind Buddha itself. This energy work is concerned with the second kind of Buddha manifestation. They exist in the same level as Western archangels, such as Archangel Michael or Archangel Raphael, or Ascended Masters such as Saint Germain. They have their specific, distinctive energy that can be recognized by energy workers. Buddhist Reiki gives you the attunement of each Buddhist deity, thereby you can make a strong connection with the specific deity, and then maintain the energetic link to get assistance from the deity for your evolution. Dainich Nyorai is the Universe itself, All That Is. This energy enhances the sense of oneness with the Universe. It can be called the Spiritual Sun (some people call it the Great Central Sun). It is the Source of everything that exists. We came from the Source, making a soul journey, and go back again to the Source. It is the essence of Oriental philosophy including Buddhism, and it coincides with the philosophy of Plotinus in ancient Roman Empire. In Shingon sect, monks perform "Ah meditation," in which they meditate and visualize that they and Ah (the Source) are One. Moreover, the name Dainichi actually means "the Great Sun." Many peoples in the world have tradition to worship the Sun deity, including Japan.The reason why the Japanese national flag depicts the red Sun is because Japanese have been worshiping the Sun since ancient times. The essence of Sun gods and goddesses is actually the Great Central Sun, the energetic source of everything in the cosmos. Ancient peoples had intuition into the energetic core of the Universe, and recognized it as the figure of Sun deities. Thus in Japan it was believed that Dainichi Nyorai and the Great Sun Goddess (the central deity in Japanese mythology) are actually two aspects of the same deity. There is a good reason to think of such a theory. Definitely, their essence is the same. If you want to see more pictures of Danichi Nyorai, you can copy the following Japanese letters to Google it: 大日如来. This is pure energy of Light. It lets you see the beauty of the Universe and the essence of You. On the other hand Kannon is very close to human, thus serves as a guide who can respond to requests made by us. It is very similar to the angel energies that Doreen Virtue is telling us about. It is also deeply involved in Reiki energy. Kannon can be said to be an almighty deity we can rely on for the constant assistance by high-dimensional, pure Light energy. 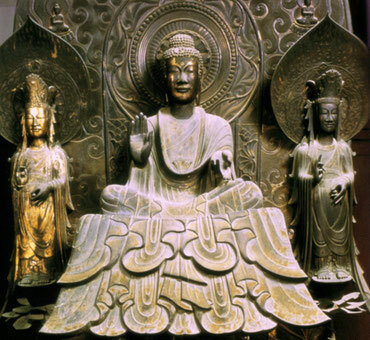 In East Asian cultures, Kannon comes with many shapes and variations. There are Sacred Kannon, Kannon with a thousand hands, Kannon with eleven faces, Kannon with a horse head, Kannon with a sacred disc and jewel, etc. Of course their energies are slightly different from each other. In this Buddhist Reiki, the dominant energy is that of Sacred Kannon (Sho Kannon), blended with Kannon with a thousand hands (Senju Kannon), because this Senju is the one deeply involved in Usui Reiki and also energy work in general. 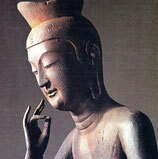 But that does not mean the other types of Kannon energies are not contained in this energy. They could manifest themselves if they are needed, because all of them are part of Kannon energy. It is also called Miroku Nyorai. This energy leads you to open yourself to cosmic energies beyond the Earth consciousness. It might remind you of your parallel lives in which you live in other star systems. It is the most "cosmic" energy of all the Buddhist Reiki, in the sense that you feel the strong energetic connection with extraterrestrial realms. Miroku is called Maitraya in Lightarian modality. I believe this is the energy of our future selves. It manifests the energy that we will have in the future eon, and send the energy back to us in this time frame. Please note: Maitraya is often depicted as a laughing, plump Zen monk. This is originally a different deity Fu-Tai, but in China Maitraya and Fu-tai were considered identical and their images got mixed. In Japanese tradition Miroku (Maitraya) and Fu-tai (Hotei in Japanese) are considered two different deities and never mixed. Thus, Miroku is not laughing. It has a more archaic, mysterious smile (see the photo. Google it as 弥勒菩薩 to see more pictures). The name of Fu-do Myo-oh means "the immovable (invincible) manifestation of Buddha." It is always depicted as a wrathful deity, with a sword and a halo of fire. However, despite his fierce appearance, he is the Love itself (I am referring to him as "he" because the energy is very masculine). The wrathful look is the representation of his determination to save all souls who have deviated into wrong paths. He is ready to sever the evil desires of the souls with his sword and lead them back to the right path. He can be said to be a rough equivalent of Archangel Michael because of his very strong power of purification. The intensity of his love energy cannot be compared. This is the one you might want if you have something you want to leave you. (Please note: some people think he is the Guardian of Hell. But actually the Guardian of Hell is a totally different deity. They confounded the two because both have wrathful appearance.) Google it as 不動明王 to see pictures. 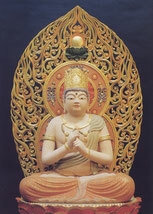 The name of Amida (Amitabha) means the Everlasting Life or Limitless Light. I understand that this Buddha figure represents the aspect of Eternity and Boundless Light of the Ultimate. I feel this Buddha as tremendous, Great Light. This is also the Healing Light. If we want to bask in eternal Light, we should go to this Buddhist deity. You might feel it is like a great waterfall of Light descending from the heaven. The tradition says that if you truly believe in this deity and recite his name, you will be brought to his Pure Land immediately after your transition to nonphysical reality (it is often called death, but actually there is no death in this universe). That is the foundational idea of Pure Land Buddhism. It is the truth, because your belief creates your reality. Google it as 阿弥陀如来 to see pictures. Yakushi Nyorai is always represented as a figure with a medicine jar in his hand. He specializes in healing, mental and physical. He has a refined healing energy, like Reiki energy. In fact you can use Yakushi's energy in the same way as you use Reiki energy. He gives us the comfort and assurance that we are connected with the benevolent universe and always getting its support. If you know Master Buddha in the Lightarian modality, you might find his energy is very similar to Yakushi's. The oldest temple consecrated to Yakushi Nyorai is Yakushi-ji temple in Nara. It was founded in 680. Some say that if you stand in front of Yakushi Nyorai statue in the main hall of this temple and worship him, your energy will be automatically adjusted and tune up by Yakushi, and after that, you can always make the same healing happen only by recalling that time. This work intends to create the same effect. Google it as 薬師如来 to see pictures. Jizo Bosatsu symbolizes the energy of the Earth. It manifests the healing power contained within the Earth, helping you ascend from the human plane to the higher dimensions. It is the energy you want to connect with when you need the power of the Earth. Please notice that when I say "the Earth" here it means not only the Earth as a physical planet, but also the energetic essence of the Earth, what you can call "the soul of the Earth." For your information, in Japanese tradition Jizo is often depicted as a child. It symbolizes the innocence and pure life energy like that of children. You can see stone statues of child-like Jizo in many places in Japan, for example, alongside a country road. They always come with red bibs. It is also widely believed that Jizo will save the souls suffering in the hell. It means the power of the Earth can awaken the souls from bad fantasy (actually there are no such things as hells, unless you make them in your fantasy). Also, as you can easily see, Jizo especially helps children and mothers, probably because the Earth has nurturing power for every life forms. Google it as 地蔵菩薩 to see pictures. Child-shaped stone figures are often called お地蔵さん (o-jizo-san) as well. 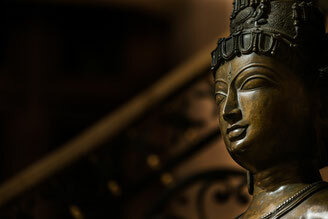 This Buddha is related to Akasha, an Indian concept meaning the vast expanse of the universe. It symbolized the power of wisdom which extends infinitely over all the space. It is traditionally associated with the power of memory. It is suggested that it is related to so-called Akashic Record in some way. Of course, the Akashic Record does not exist in some specific space in the universe, but rather it is more concerned with the omniscient wisdom of enlightened beings. Those who want to know about cosmic wisdom might want to connect with his energy. It has the most "cosmic" kind of feeling along with Miroku energy. You will temporarily leave the energetic atmosphere of the Earth and stay in the deep space energetically. Google it as 虚空蔵菩薩 to see pictures. Though the name Shaka often refers to Gautama Buddha, the founder of Buddhism who had a physical incarnation in the 5th century BC, Shaka Nyorai symbolized the more cosmic aspect of him, that is, what he actually is in the cosmic context. In fact Shaka never died, only manifesting the fantasy of his death as a teaching tool for saving degraded humanity. He is the everlasting Life itself, as described in the Buddhist sutra The Wonderful Dharma Lotus Flower. This deity activates the area of mystery which lies deep inside you. It enters the heart space there, awakens the spiritual essence in the center of the heart, and brings it to the awareness. It also leads you to recognize the same spiritual essence in other persons. The picture shows the Shaka Nyorai and two attending bosatsu (boddhisattva) of Horyu-ji temple, the oldest Buddhist temple in Japan (founded approx. 1,400 years ago). The archaic expression of Shaka's face captures the mysteriousness of this deity. Google it as 釈迦如来 to see other pictures. Fee: 45 US$ for each deity. If you order all 9 energies in advance, I can offer you 10% discount (364.50 US$ for all 9). Attunements are done via remote sessions. I will send you instructions by e-mail for how to receive the transmissions. The Order of receiving attunements: When you apply for 2 or more energies, you can either set the order of attunements yourself or let me decide it intuitively. There is no preset orders for receiving them. Requirements: No requirement, but some experience in energy work is preferred. Intervals between attunements: Up to 1 deity in a day. You can receive the next attunement from the next day of the previous one. Paying method: PayPal. I will send you a PayPal bill after I received an application. For residents in Japan, bank transfer is also accepted (Yucho Bank or Rakuten Bank). Note: For each stage I will send you in advance an e-mail with the information how to receive the transmission. Please notice that in this work there is no symbols and mantras like Usui Reiki, though the names of the deities have the power to evoke the specific energy and thus play the same role as Usui Reiki symbols or mantras. Finally, I'd appreciate it if you understand that the completion of any stage does not qualify you to give the same attunement(s) to others. The purpose of this work is for your spiritual benefit only.